The big news of the day is a Canadian study looking at patterns in hospital data that link the timing of hospitalization for heart attacks and flu infections. This study zeroed in on the medical records of people who, over a two-year period, had both confirmed diagnoses of heart attacks and flu during that time window. They found that during the first week following a positive flu test, heart attacks were more common than in any other week of the two-year timeframe that they looked at. Twenty heart attacks occurred in that first week, compared with an average of 3.3 heart attacks for all other weeks (a “six-fold increase”). 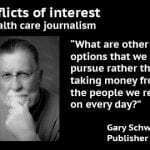 The timing of those twenty heart attacks suggests that the flu may have played a role, the researchers suggest, and that link is what most news headlines reporting on the study latched onto. By including the comments from an independent source, STAT News did a good job of explaining why this six-fold risk is newsworthy, but doesn’t translate to the general population. They pointed out that people who are sick enough to see a doctor and get tested for the flu virus are likely different in important ways from people who don’t get so sick from the flu. Results from these people may not generalize to the rest of us. 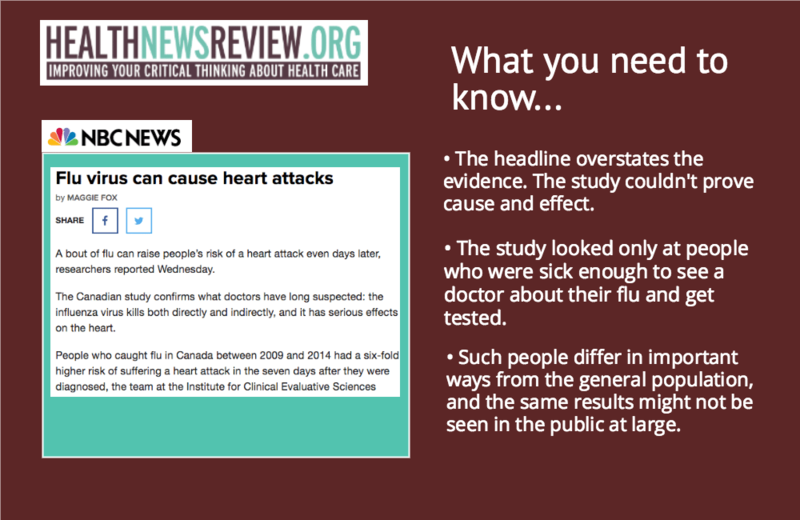 Many news organizations didn’t provide any counter-balance, and NBC News’s write-up was especially worrisome, because its headline jumped beyond the capabilities of the study to pronounce “flu virus can cause heart attacks.” The study wasn’t designed to show cause and effect; all it could do was find notable patterns in medical charts. 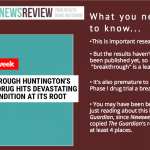 What's going on with Newsweek's health/medical news coverage? What you need to know. 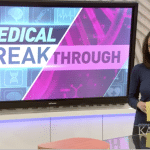 Local TV news sweeps period bubbles with "breakthroughs"
Thanks for alerting us. 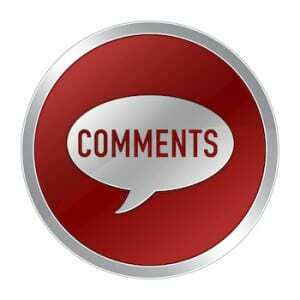 I can’t find a link–can you share?